Already delicious, but too aggressive and unbalanced. 81 points. Burnt cherry, roasted nuts. Behind it are wine flavors. Alcohol is noticeable. Figs, honey. Currants, raisins. Some dried apple. Good mixed trail mix. An artificial perfume note, flowery and sweet, crystallizes out. Actually, that always bothers me, here it fits. Cumin is still there. Water : The nose becomes fuller and spicier. Oak now comes through and is suddenly dominant. Hot, toasted wood. Hardly sweet. After some time, nut biscuits will flash. Medium long and dark. Dry fruits remain. The strong guy starts immediately with pungent solvent. The alcohol is immediately at the start. Let stand ... Furniture polish, leather, juicy figs, rubber duck, wet wood, nut nougat chocolate, herbal liqueur. Behind it, more and more berries come to the fore and it gets sweeter. Sugared raisins, blackberries, blueberries and sour cherries. There is still a thick, sour berry jam in the game. Smells mineral and moist moss. With time, comes something else that reminds of chainsaw exhaust. With some water: Significantly more wood. He looks older and more set now. For that he has set the sweet notes behind. Pleasantly creamy start with honey. The oak comes with its spiciness and subtle bitterness. Now come the ripe, sweetened berries with cocoa. The leather and the mineral notes are there. The guy is wild and strong and gets space and space. Tart, dense herbs. And again chocolate. The alcohol brings along a good dose of chilli. With water: Older, milder. Much milder. The chili sharpness gives way. The alcohol brings a cool menthol note. Sweetish taste now. But a little less chocolate. For more cherry. Long. Caramel with a little chilli. Getting a little drier. Sweetened dried fruit. Bonus points for catching me off-guard with that nose. This won’t be for everybody for sure. Another wayward Deanston. The palate is fun as well, a pendulum of sour and sweet. Great Deanston if you like funk! Varnish and sourness – grape juice perhaps? Shortpastry crumble with a little too much candied lemon peel and balsamic vinegar. Very odd nose! With water: oranges a plenty and epiphanic throwbacks to some great Glenfarclas bottling I had many many moons (a 1993 vintage) ago! Sour, musty oak at its finest, with coffee and pickled olives. The sourness comes with a crescendo at first. But then there is a juicy-dewey sweetness; reminiscent of honey dew and blue berries. Honeyed herbal tea, lime cordial, orange zest, and very mild caramel. Medium-short. The caramel departs quickly; leaving behind sweet undertones and a touch of sage. High voltage in the nose, a bit of an adhesive (Uhu? ), dry Sherry but way too much alcohol... Can take a lot of water obviously, gets sweeter but remains only ok. Stick to the deanston 12, cheaper and better. 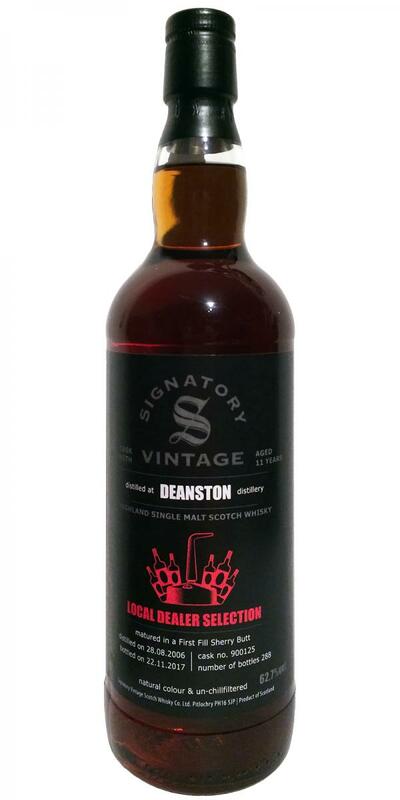 Sherry without end - only by Deanston no trace. Once again a whisky, which is so superimposed by the sherry keg, that nothing remains of the distillery character. He is strong and full, but also soulless and thus very arbitrary. Too bad. a really delicious chocolate bar, not really fruity, not really complex, but what he does, he does really well! Can compete well with some younger Glendronachs, and at half the price! Pure: surprisingly almost no alcohol. Instead, a wall of melted milk chocolate, nougat and gingerbread. On fruits I find dried figs and the classic sherry raisins. With water: something dark cherry comes through, espresso. Pur: wow, too concentrated here, sweet chocolate at the beginning. Yes tarts. Slight cherry note, hardly any oak. Reminds me of the overall picture of young well matured Glendronachs. Sherry chocolate bomb. With water: even more fruity, otherwise the overall impression remains: chocolate shock. long, sweet, Kaba with exaggerated amount of powder in the milk (as I like it).